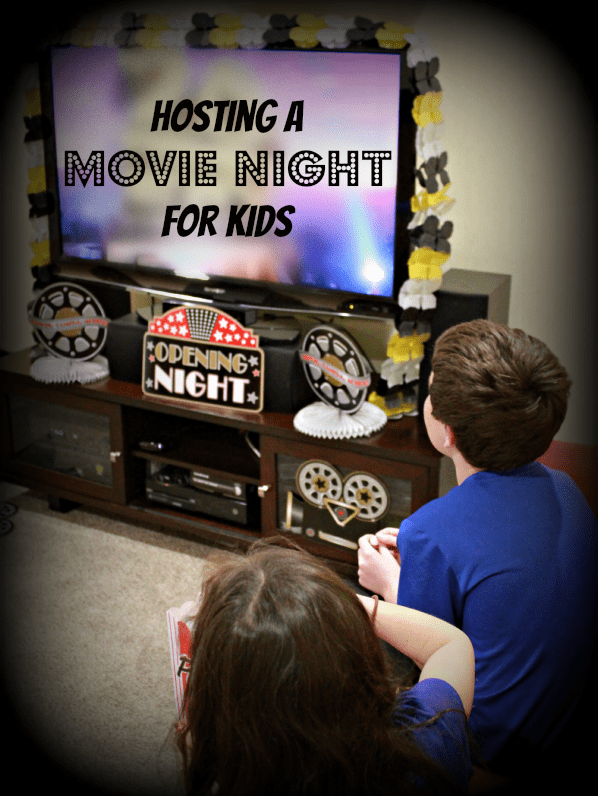 10 Kids Movie Night Ideas that Your Family Will Love! Ready for a fun family movie night?! 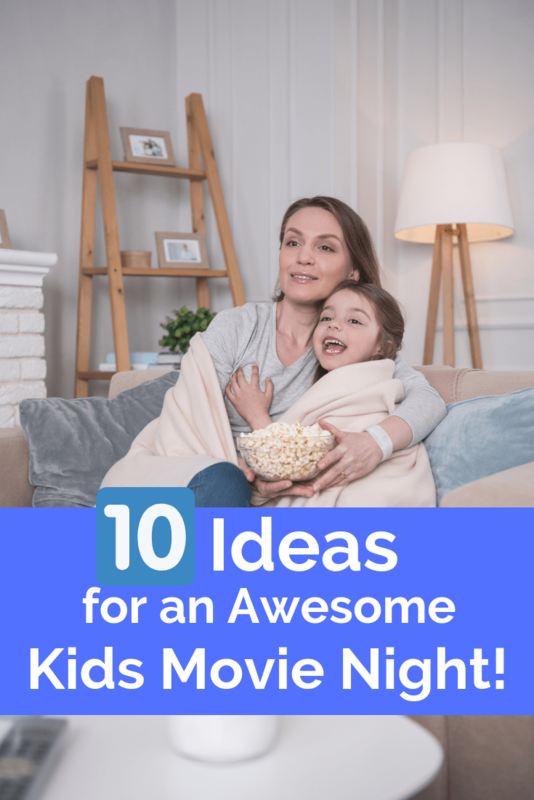 Check out these 10 kids movie night ideas to put a smile on your kiddos’ faces and enjoy an evening together at home! Compensation was provided by Orville Redenbacher’s Popcorn via Mode Media. All opinions are 100% my own. A few months ago, we took a trip into downtown Boston to enjoy an outdoor movie night. We had so much fun that we decided to host our own movie night at home. This time of year, evenings are too chilly to host a backyard movie. Instead, we decided to turn our TV room into a movie screening party for my kids and their friends. My kids had a blast making plans to surprise their friends with a fun experience at our house. 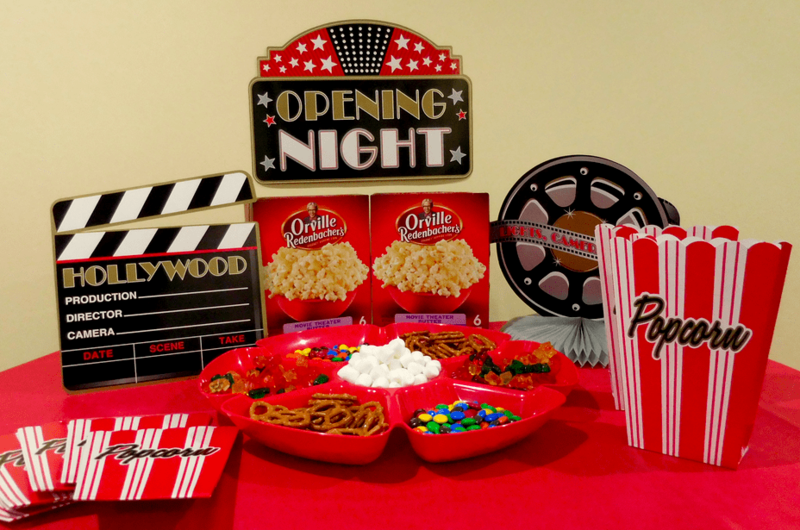 Here is how we pulled together our own Movie Night for Kids featuring Orville Redenbacher’s Movie Theater Butter Popcorn. 1. Get creative with invitations. We found these adorable invites that look like movie tickets. These would be easy to make at home yourself too! 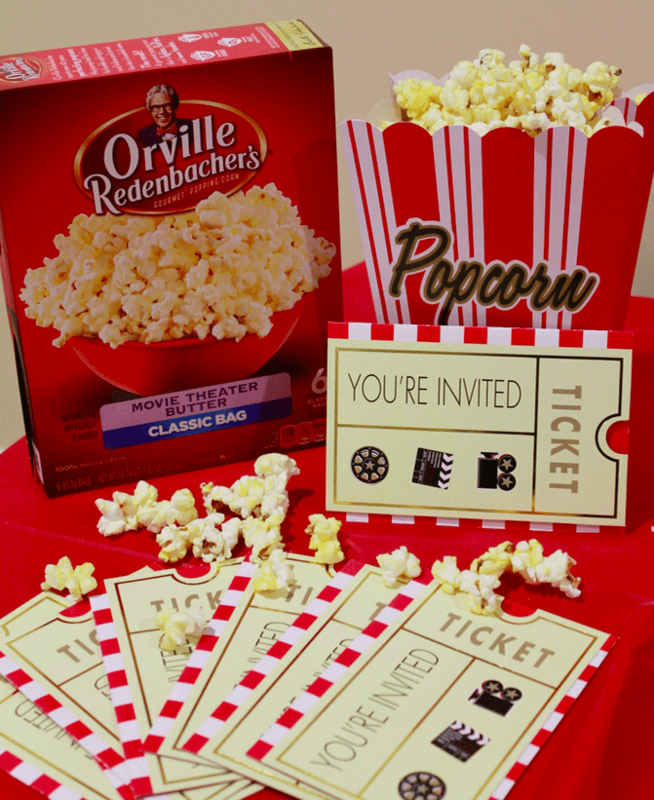 If you’re planning a night with your children and their friends, you can have them give out these movie night invites ahead of time – similar to how you would do it for any party or get together. If you’re simply planning a movie night for your own kids, try slipping this in their backpack or lunchbox to surprise them – they’ll look forward to it the rest of the day! 2. 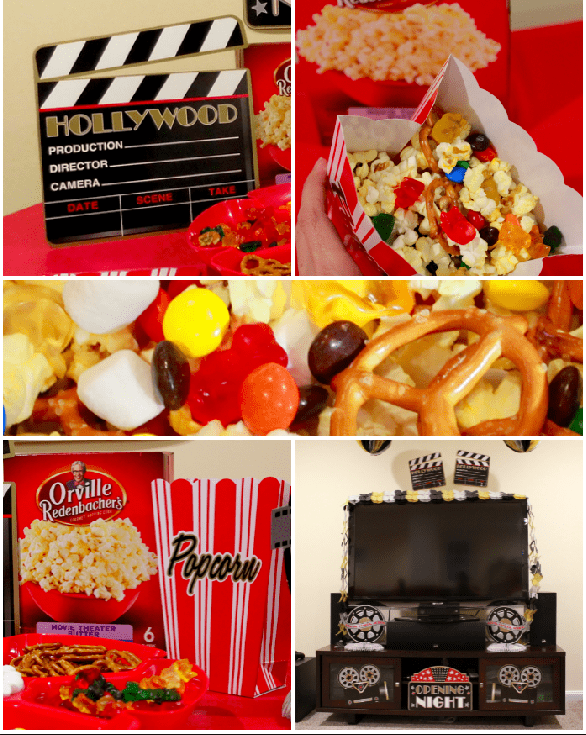 Go all out with movie decorations! Try shopping your local party store. We found an amazing package of movie-themed decorations for only $10. We surrounded the TV and decorated our refreshments table to make it look super festive. We also purchased popcorn bags so that each child could have their own, like in a real movie theater. 3. Or consider a theme night! Instead of the standard movie decorations, you can also consider a theme night. We did a “Cool Runnings” theme night at our house recently where we watched the movie, had tropical Jamaica-themed decorations hanging up, and enjoyed Jamaican jerk chicken for dinner! 4. Create the right atmosphere. When it comes to an at home movie night for the kids, we’re all about making it casual and comfy. We told kids they could even come in their pajamas if they wanted to. Make sure to have blanket and pillows available so that everyone can get comfortable. 5. Think about the number of kids and seating. If you’re inviting friends of your kids over, remember not to squeeze in too many. You want the kids to be comfortable. They typically need a bit of wiggle room. We brought down extra pillows and a few extra chairs so that everyone had a seat without blocking the view of anyone else. Obviously the right number of kids to invite depends on your personal preferences and the size of your living room or family room! 6. Let the kids vote for the movie! At this kids movie night, we selected 3 current popular kids movies and had them vote for their favorite. The winning movie was our feature for the night, as though they were at a big Hollywood award show. 7. Make a Popcorn Mix-ins Bar! The star of our refreshments table at our kids movie night was Orville Redenbacher’s Movie Theater Butter Popcorn. We all love the taste of the Orville Redenbacher’s Movie Theater Butter Popcorn. I love that it pops up in minutes to become a light and fluffy snack. 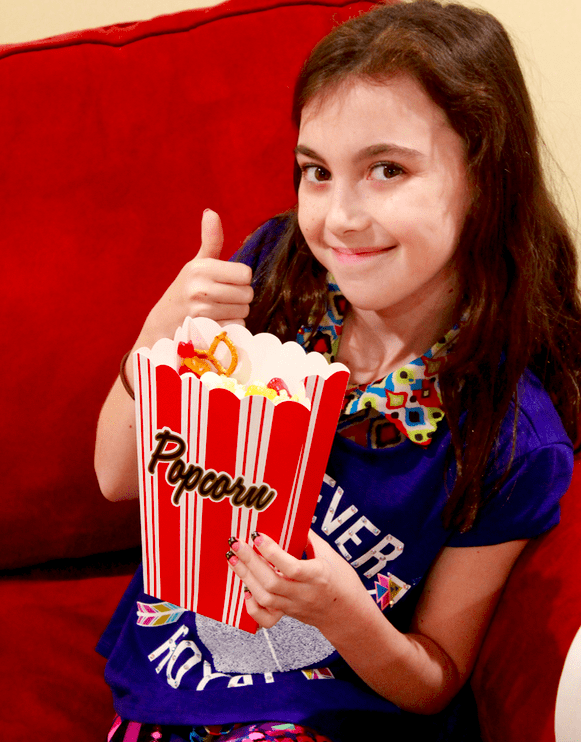 We created a fun popcorn mix-in bar – super easy to put together and since each kid can customize their popcorn, everyone can find a snack they love. If you’ve got little kids, you can add to the excitement with this kids movie night idea – have them dress up in line with the movie! Watching a super hero movie? Make a fun cape for your little one to wear before the movie starts. Is it a sports-themed movie? Have them dress up in their favorite sports gear. A princess flick? Your daughter can put on her favorite fancy dress! Obviously the older kids probably won’t go for this – but it’s great for preschool and kindergarten age kiddos! As your kids get older, consider having a plan for a monthly read-and-watch. First, your child reads the book that the movie is based on. Then it’s time for the family movie night! After, you can chat about which was better – the book or the movie. (Even as an adult, I still love doing this!). 10. Combine movie night and game night. 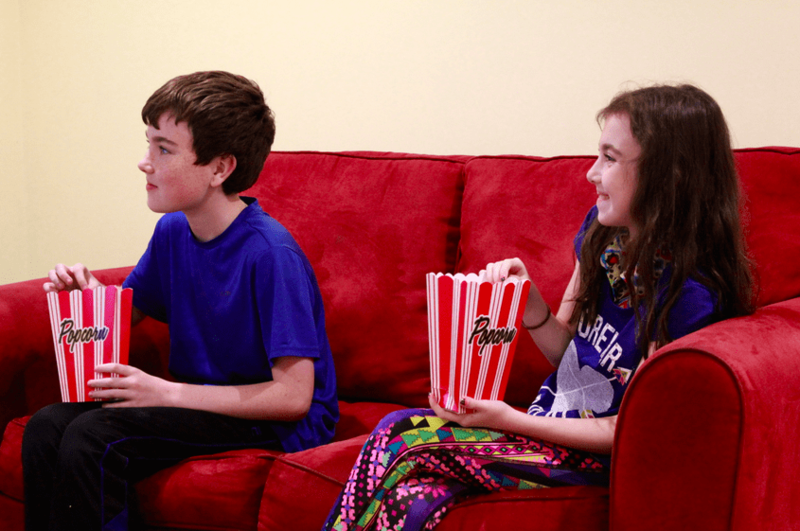 Movie nights are fun and game nights are fun, but combining them can be the best! 😉 Think about making a “movie bingo” board to go with a great kids movie, and your kids can check off scenes or phrases as they hear them. 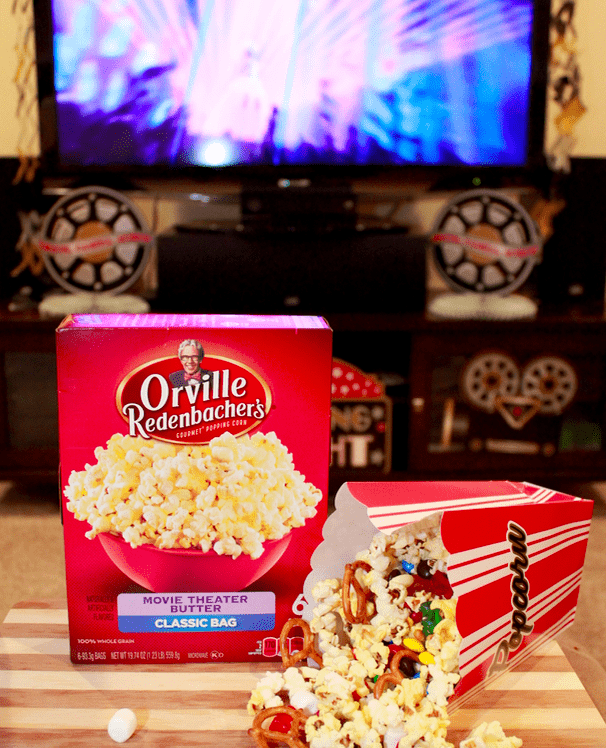 Thanks for “popping” over and reading about our kids movie night ideas. Have any other ideas or kid movie night experiences? Absolutely adorable! I can’t remember the last time I hosted a movie night for the kids. Although a movie night with friends would be okay too for the ideas here! I so love the popcorn mixins corner! we love movie nights! what a fun way to spice it up a bit! I don’t yet have kids…however I live for a great movie night with friends =) I am going to use these ideas for my next girls night in! I don’t yet gave kids…however I live for a movie night with friends =) I will be using these ideas for my next girls night in! What a great and fun idea! Cherished memories for you and your kids for sure. I really like the idea of kids having a say in the movie night feature! LOVE the candy mixed in with popcorn too.